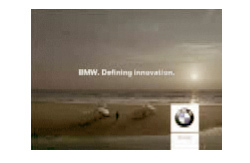 BMW recently launched a TV commercial featuring Dutch artists/scientist Theo Jansen. Jansen is reknown as the charismatic creator of the kinetic sculptures that behave as artificial animals and BMW teamed up with him to profile their leadership in the fields of technology and innovation. Last year, Honda created a popular commercial, which was a replica of the exceptional 30 minute cinematic artwork Der Lauf Der Dinge (The Way Things Go) from 1987. In contrast to Jansen in the BMW commercial, the artists (Peter Fischli and David Weiss) were not credited in any way.